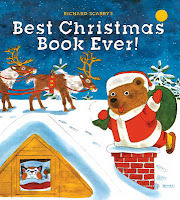 Bookfoolery : 3 Christmas Books - The Christmas Journey, Richard Scarry's Best Christmas Book Ever! and The 12 Days of Christmas in Washington, D.C.
3 Christmas Books - The Christmas Journey, Richard Scarry's Best Christmas Book Ever! and The 12 Days of Christmas in Washington, D.C. Since I was going to shoot for mini-reviews anyway, I've decided to put three of the Christmas books I've recently read together in a single post. I'll tell you what they're about, whether or not I liked them (Blogger Game Cheat: I liked them all), and whether they're worth buying, in my humble opinion. Donna VanLiere is known for her charming, often amusing and deeply touching Christmas books. In The Christmas Journey, she departs from her usual delightful storytelling and tells the story of the journey Mary and Joseph took to Bethlehem. The story is told in two parts. First, the rhythmically beautiful tale told in the words of the Bible is repeated. Then, the author shares why she believes the Bible version is a little too tame and moves on to the second portion of the book. The latter part is a grittier retelling of the Christmas story, in which the feeling of being outcasts, the pain of riding on a mule while 9 months pregnant, the fatigue from a long journey and filthy conditions of the barn where Jesus was born, along with other such realistic discomforts are described. VanLiere wrote the second bit to read at her church and I think that--and similar group settings--is, in fact, what it's best for, although I would pick up a copy and peruse it before considering its potential audience. I think it would make a good keepsake book for reading around the tree as a family or sharing in church -- or just for your personal reading. I liked the way VanLiere took the story and put it in more human terms. However, for reading to children I'd look for a slightly larger book because The Christmas Journey is the same size as VanLiere's other books and has lovely watercolor illustrations, but they're a bit too small. If you're going to read it to children, it would be best one-on-one. I enjoyed the reading and read the first part aloud to the cats (the Biblical portion) while we waited for our tornadic weather to pass, earlier this week. Donna VanLiere's Christmas movies will be airing on Lifetime TV. Link at left leads to the schedule. 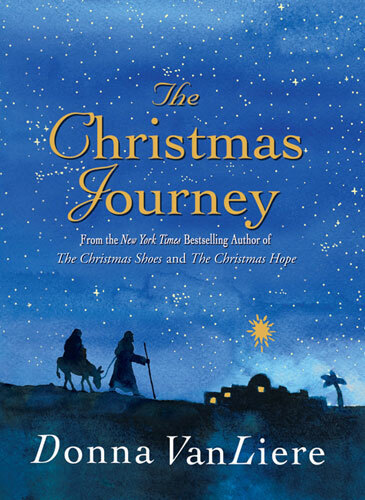 There is a contest to win all of Donna's Christmas books, including an autographed copy of The Christmas Journey that ends on December 14th: link here. When my children were small, I discovered Richard Scarry via hand-me-down books from my husband's family and they were always a hit. Scarry's characters are cute, friendly-looking and quirky, his stories amusing and often very sweet. Richard Scarry's Best Christmas Book Ever is loaded with stories, 2 Christmas songs (with easy musical scores for playing at home) and even a board game. I had fun reading this book to myself, but I'm definitely going to have to find it a happy home with children. Loads of fun and definitely worth buying for the young family on your gift list. I don't think you can lose with Richard Scarry. There were some stories I consider personal favorites, but I enjoyed them all and kind of wish I had a little one around to share it with, this holiday season. Did I tell you I begged a publicist for Christmas books because I was in a mood for Christmas reading, last month? Well, I did. Richard Scarry's Best Christmas Book Ever and The Twelve Days of Christmas in Washington, D.C. were two of the books I received and I was very pleasantly surprised by The Twelve Days, etc. 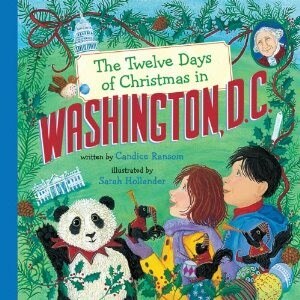 As you may imagine, the Washington D.C. book is merely one of a series of "Twelve Days of Christmas" books set in different locations across the U.S. It tells the tale of Olivia and James. James lives in Washington, D.C. and in an opening letter invites his cousin Olivia to visit for the holidays. Then Olivia describes the places she visits and things she learns via letters home to her mom and dad on the left-hand page of each spread. On the right-hand side of every spread is a "12 Days of Christmas" rhyme (part of the rhyme to go with each day's activities and then the entire list, thus far, as in the original song). At the end of the book, there's some additional information about Washington D.C. and a list of famous Washingtonians. The Twelve Days of Christmas in Washington, D.C. surprised me in the same way I was pleasantly surprised by the Fancy Nancy book I read to my niece during our family reunion in Colorado, this summer. I expected fluff and instead found the book is actually educational. The illustrations are delightful and detailed enough to give young readers a lot to look at. If I had young children, I would be tempted to buy several from the Twelve Days of Christmas series (link leads to Sterling's website, where you can see all of the titles) and continue to collect a few each year because I absolutely love an entertaining book that's also educational. For gift-giving, it would be loads of fun to send a child on your Christmas list a book about your area -- or theirs -- for starters. I absolutely loved this book and highly recommend them for gift-giving. Obviously, I've been on a bit of a posting frenzy, this week. That will continue for a while, since I'm accustomed to taking off 2 or 3 weeks from blogging to enjoy family time during the holiday season. As always, please feel free to comment only when you feel compelled to do so and don't feel obligated to read everything!! My daughter discovered Fancy Nancy all by herself, and now we've read every one the library has. She loves those books! Especially learning the fancy vocabulary, I think. Wahoo for your daughter! I was totally impressed with the Fancy Nancy book I read. I don't know why I thought it would just be a cute rhyming book -- maybe I was misled by the cute illustrations? -- but they're super teaching books.